Speculation has been rife as to what the next version of Windows will offer, and finally we’re about to find out. What is the operating system we’ve been calling ‘Threshold‘ really called, what is it like and when can we get our hands on it? 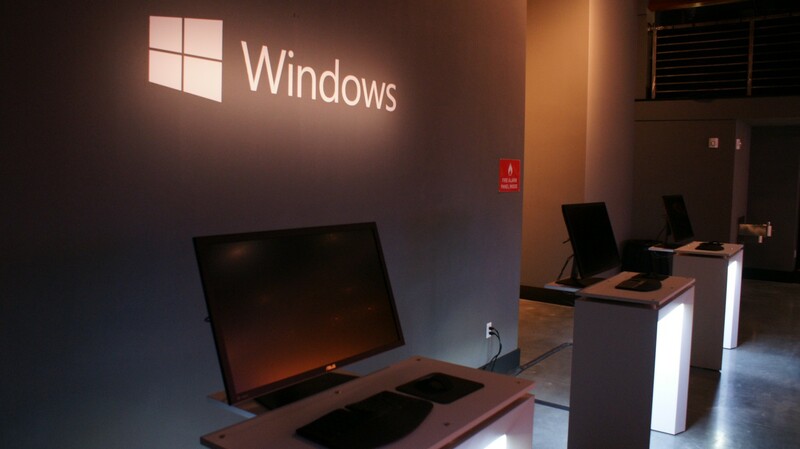 Join us as we liveblog from Microsoft’s special event. 11:02 AM: That’s it folks. I’m going to go try out the early builds of Windows 10. Thanks for following along. 11:01 AM: Question if Microsoft if Windows updates will now have names that involve big cats. Some lulz. 10:57 AM: How much of a threat does Microsoft consider Apple and Google in the Enterprise? Myerson:We’ve listened to the customer on what they need from us. At the core, we’re product people. The other side of that enterprise is a human being. We listen carefully to what they are saying to us. It’s a non-strategic answer. Let’s build the best product we can. 10:54 AM: Do you feel that it will delight enterprise and consumers? They have a strong belief that designing the UI right will scale. 10:53 AM: Building it all at the same time, But the schedule of the phones means working with carriers. 10:51 AM: How will you take feedback from users during the preview program. Myerson: “We’ve never done this before. As an insider you’ll see a variety of things.” There will be survey tools, forums with engineering team participating. 10:49 AM: Push back from channel partners that looks like old Windows?Belfiore: We don’t hear pushback, “We don’t like live tiles.” We hear this takes too much training. 10:48 AM: While there are multiple teams (Desktop, phone, etc) there is a team that works on a common core for Windows. 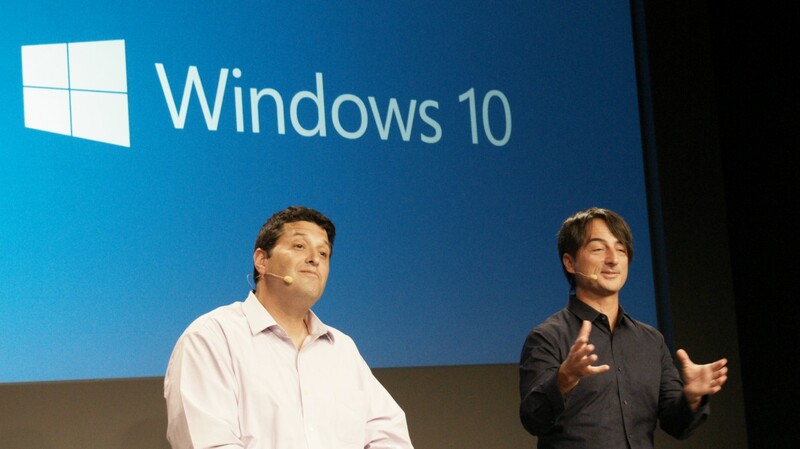 10:44 AM: Is Windows 10 the next version of the phone operating system? Myerson: Yes – It will be a natural step forward. They will talk about it more next year. 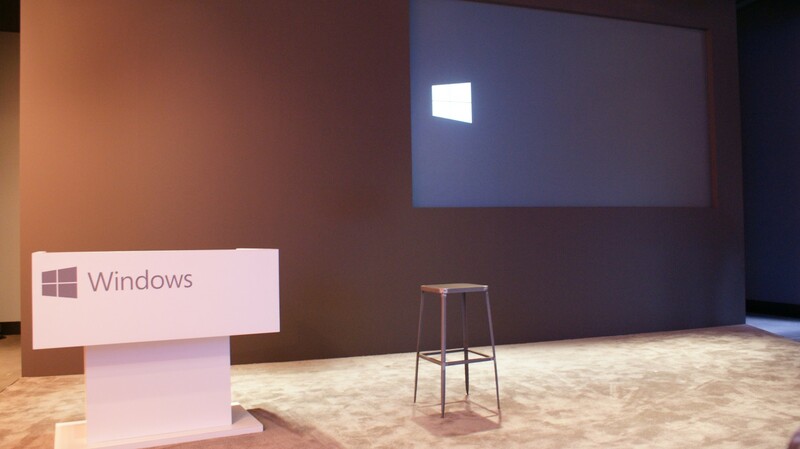 10:44 AM: The technical preview builds will install on Windows 7 and Windows 8 machines. 10:43 AM: The name. Why Windows 10? We have tested it with people and was the name that resonated best with what we will deliver. 10:42 AM: Q&A time: So word on incentives for users to update yet. 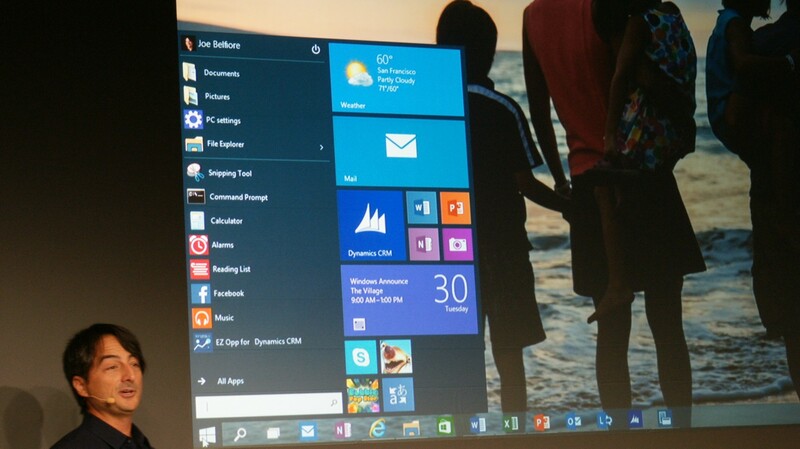 10:41 AM: Windows 10 is launching next year after the Build conference. 10:39 AM: starting tomorrow Windows Insider program. for people comfortable running software that’s well beta, yeah. They want to set expectations right. This will be shared earlier than anything before. 10:38 AM: trying to be thoughtful about an approach for everyone. Feeling good about the general direction. 10:37 AM: Thinks two-and-ones are huge opportunities to make productive people even more productive. 10:35 AM: in tablet mode, it makes apps fullscreen. There’s a software back button. You are prompted to enter and exit tablet mode. 10:34 AM: will be showing a design motion study. Build a UI that changes it’s mode is a keyboard and mouse are present or not. 10:33 AM: The category of devices we are excited about is two-in-ones to help people get things done. 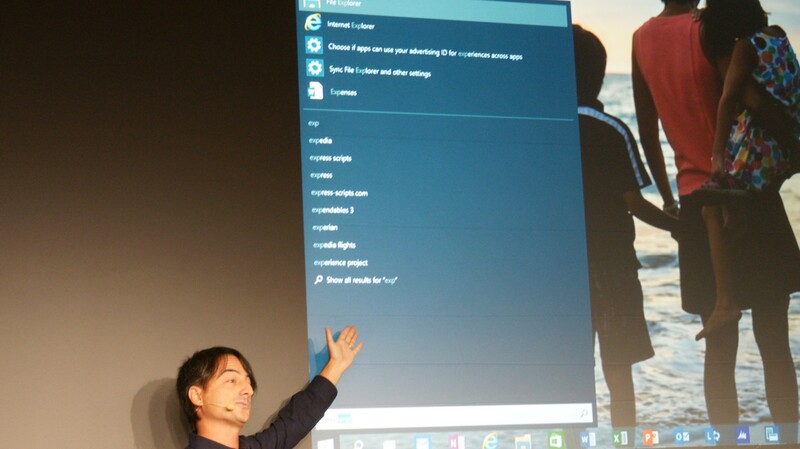 10:32 AM: With Windows 10, when you swipe in from the left, you get the task view. 10:32 AM: When you swipe right, the charms bar will still be present. The charms bar will change. 10:31 AM: Microsoft is not giving up on touch. Here comes the touch demo. This is not the final UI. 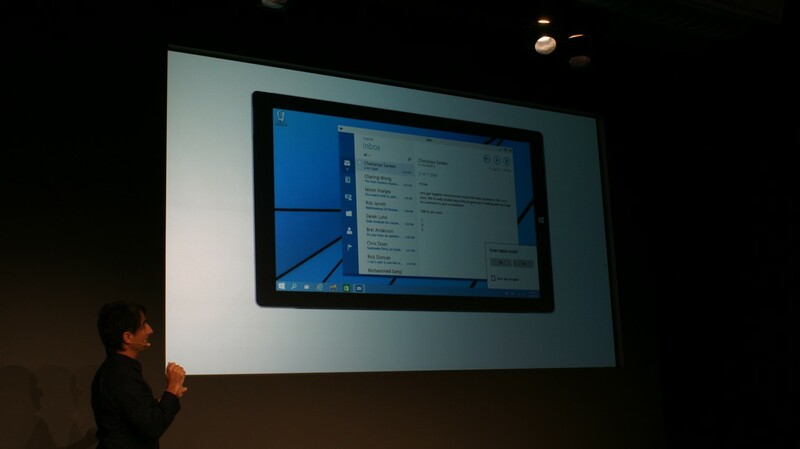 Want to support the Windows 8 users that have touch machines. 10:25 AM: to work with a task with lots of windows. Use snap assists a new feature. It tiles the windows and desktops. You can snap into quadrants. 10:22 AM: Multi-tasking talk – want to empower novice users to use multi-tasking. Now with power view you can see task view. Now it supports multiple desktops. You can snap elements. 10:21 AM: There is no more duality in app launching with Windows 10. 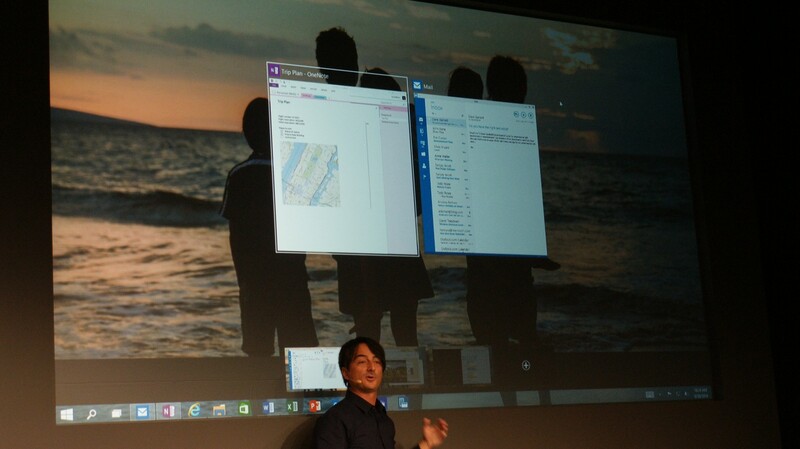 10:20 AM: The tiles and apps are a blend of Windows from the store and other places. 10:19 AM: Talking about universal Windows app model. all in the Windows 8 Store platform. 10:17 AM: Want to represent your unique personality and needs. 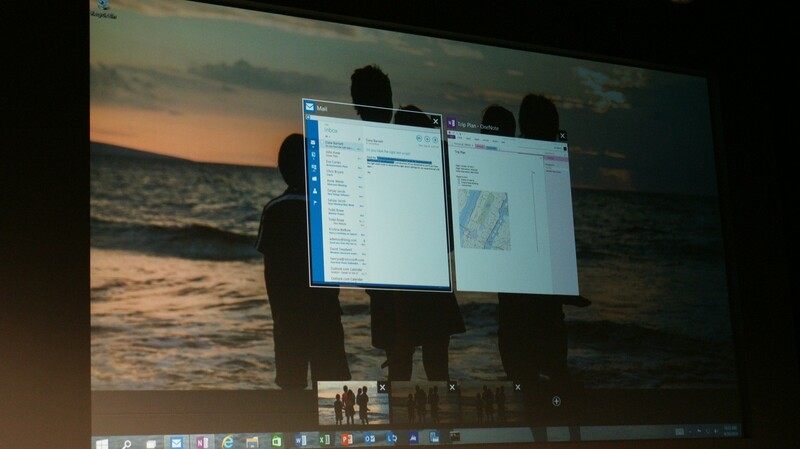 You can resize the start live tiles. 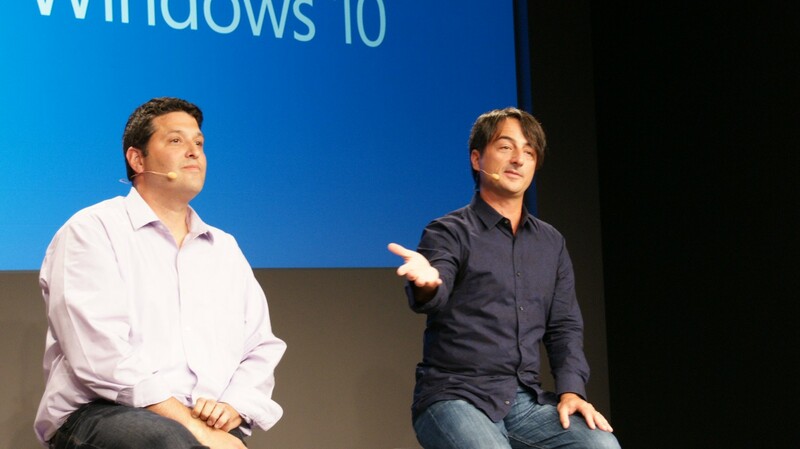 10:16 AM: Belfiore says going from Windows 8 to Windows 10 is like going from a Prius to a Tesla. 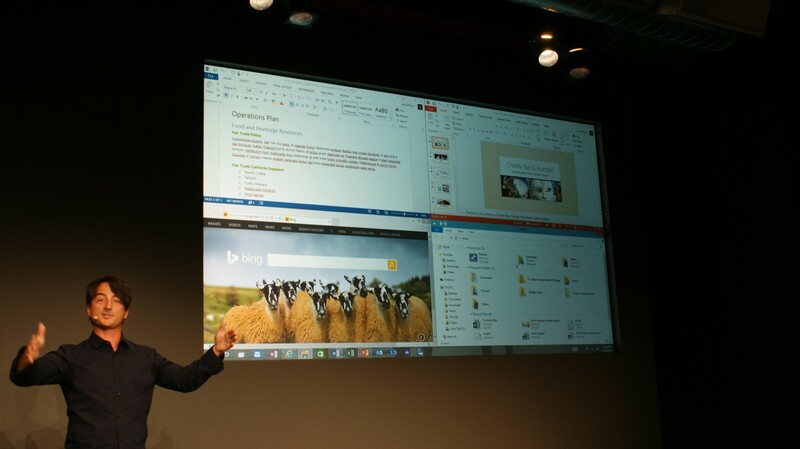 10:15 AM: showing the Start Menu. Who’s excited? I am. 10:13 AM: They are showing early to start dialog with enterprise customers. Will focus on the core experience. 10:13 AM: The software we are going to see is a very early build so there will be rough spots. 10:12 AM: Joe Belfiore is on stage. The best hair in tech. 10:11 AM: All devices can be managed by one tool. Customized store. security: separates corporate and personal data on devices. 10:09 AM: Enterprise value: will be familiar to the end user. Will be compatible with all the tools and apps they are using today. 10:08 AM: Starting dialog with enterprises today. 10:06 AM: Embodies what our consumer and enterprise customers expect. Will run on the boradset devices from IoT to Servers. 10:05 AM: The new Windows is Windows 10. 10:05 AM: Wouldn’t be right to call it Windows 9. 10:04 AM: “Must empower in how they work. Let’s talk about the new Windows.” Here comes the name. 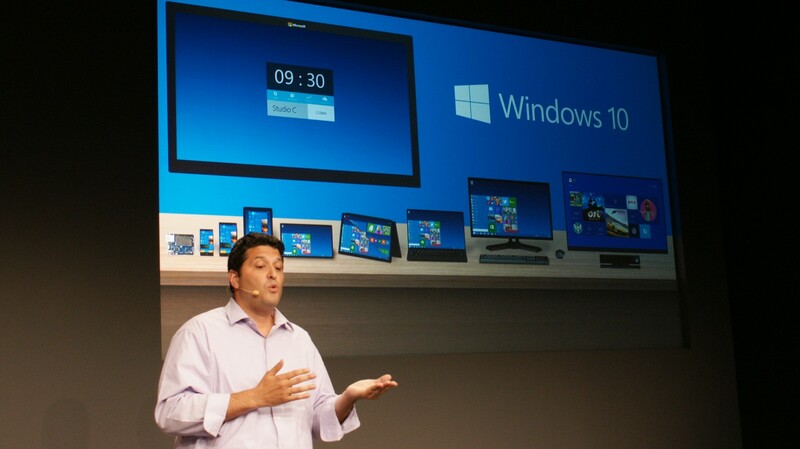 10:02 AM: Terry Myerson: There are one and half billion people using Windows today. 10:01 AM: We’ve just been informed that the presentation will begin shortly. 9:48 AM: There’s a group of demo machines near the stage. I hope we get to play Halo. 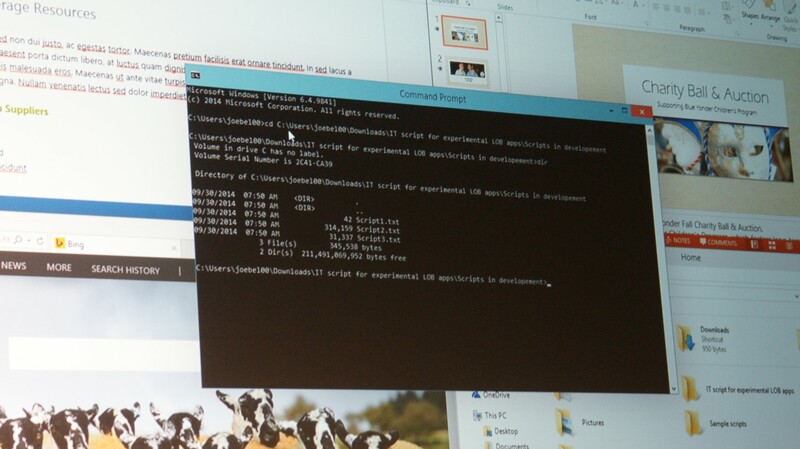 I mean demo the newest version of Windows. 9:45 AM: They’re playing what I suspect is bossa nova music. It’s a nice mellow groove for a groovy discussion about Windows.